Cost to install holiday lighting varies greatly by region (and even by zip code). Get free estimates from electricians in your city. Cost to install holiday lighting varies greatly by region (and even by zip code). 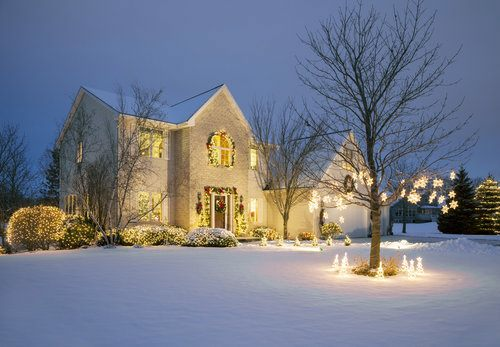 The average cost of installing holiday lighting is $1,500 - $2,500​. How much does it cost to install holiday lighting? Holiday lights are a popular type of decoration that people install in and around their homes at certain times of year. Typically, these lights are connected to one another either on an insulated wire, or in a plastic rope. They come in many styles, sizes, and colors and may be themed for the holiday they are being used for, such as Halloween, Christmas, or Valentine’s Day. While it is possible to install many types of holiday lights yourself, there are certain benefits to having them professionally installed as well. There are many factors that go into determining how much professional installation of holiday lights will cost, including the number of lights, the size of the home, whether trees are being included along with the house, and whether or not you already own the lights to be installed. In most cases, the first year is more costly due to the purchase of the lights, while subsequent years with the same service will cost less. Most homeowners will pay somewhere around $800 to $1,500 for the first year, which includes covering the entire home and at least two trees in the yard with lights. The minimum amount you can expect to spend is between $200 and $500 for lights only around the windows and doors of the same home. Most companies that specialize in hanging holiday lights will offer design consultation services as well. This is one of the benefits of having professional installation done: the company is able to offer you ideas and solutions you may not be aware of. In most cases, this consultation is free and is done at the time of estimate for the lights. At the time of the initial appointment, the consultant will walk your property with you, determining where and how many lights you want hung, as well as any extras. They will offer ideas and options, with different price points. For example, wrapping a tree completely costs around $400, while a loose wrap costs about $300. The design consultation will help you make the most of the project and find the package that best fits your home and your budget. The size of your home, the number of stories, and the height of your roof will all have an impact on the total cost of your installation. While nearly every installation is given custom pricing, depending on the look you want and the number of lights, there are certain minimum costs based on the size of your home. 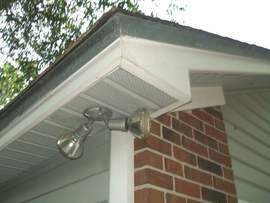 For example, running lights along the roofline of a small, one-story ranch will cost about $600 for the first year, while running lights along the roofline of a larger, two-story home will cost between $700 and $800 minimum, with costs potentially reaching $1,400, depending on how many gables, eaves 1, overhangs, and other architectural features your home includes, as well as the height of the roofline 2. You have a lot of options to choose from when it comes to the style and type of lights you want to install on your home. Your installer will help you make the determination of which lights to use on which parts of your home. Icicle: icicle lights are hung on a long strand, but the lights themselves are made to hang downward from the strand, looking like icicles. They are typically hung from the roofline 2. String: string 3 lights are the most common type, and the ones that you will typically use the most of. The lights themselves are on a single strand of insulated wire and come in many different lengths and with a variety of bulb sizes to choose from. Net: nets make it easy to cover bushes and smaller trees that you may have outside your home. The lights are arranged on a small net that can wrap plants of various shapes and sizes. Path: path lights will illuminate the way to your front door. These are ideal if you have parties, or if you plan to use the outdoors and want a festive way to guide people through your yard. Novelty: in addition to classic lights, many companies now offer novelty lights that can be themed for the holiday, including snowflake lights, Santa lights, pumpkin lights, and heart lights. Battery operated: if you want to save on your electric bill, or if you have areas that are hard to reach by extension cord, battery operated lights are available that can make lighting areas far from your home easier. Solar: another option to help save on operating costs includes solar-powered lights. While there aren’t as many options for solar lights, it is possible to illuminate areas of your home with this type of strand if you get enough sun during the day. In addition to the style of the lights you choose, many companies offer choices for the bulbs as well. Different bulbs can offer different looks, colors, and energy efficiency, making the choice of bulb equally important as the type of strand. Mini: mini bulbs typically have more lights per strand than larger bulbs, giving them a more subtle and twinkling effect. They come in all colors and both LED and incandescent. Strands are relatively cheap for this size, costing about $2 for 5 feet. Dome: dome bulbs are a newer style, typically used on LED strands. The shape of the bulb is a tiny, rounded dome. They’re about the same size as traditional mini bulbs, but without the pointed tip. These are more expensive, however, at about $9 a strand. C9: C9 bulbs are larger, and come in multiple colors as well as white. They have fewer bulbs per strand, but give a more dramatic appearance. C9 bulbs cost about $15 a strand. LED: LED bulbs are more energy efficient. Their colors can be cooler or brighter than incandescent, but newer colors are available that more closely mimic the warm colors of traditional lights. Costs for LED bulbs tend to be based on size, ranging from $2 to $20 a strand. Incandescent: incandescent bulbs are the traditional lights most people are familiar with. They cost less to purchase, but will cost more to operate over the season. Incandescent bulbs tend to be cheaper than LED, running between $2 and $10 a strand. Holiday lights are available in a wide range of colors, which can allow you to create themes that complement specific holidays, or just find a display that works for your tastes. All types of lights, including mini, dome, C6, and net are available in single colors such as white, red, or blue, as well as in multi-colored strands. LED lights also come in different light “tones”. Traditional incandescent lights have always had a warm hue to them, reminiscent of candles, while LED lights had a brighter, true white glow. Now, however, LED is available in both the warmer colors usually found with incandescent lights, and the brighter tones many people have come to associate them with. This lets you get the color you want for your home, along with a more energy efficient bulb. The color of the lights rarely affect cost, with most lights costing about the same for the same type and size of light regardless of color. One reason to opt for professional holiday light installation has to do with the fact that professionals are able to offer architectural lighting, or lighting that highlights the specific features of your home, such as gables, eaves 1, dormer windows, roof lines, windows, doors, and garage doors. Most lighting packages offer some degree of architectural lighting, such as along the roof line. Adding other features, such as the garage doors, will add to the cost of the package. For example, lighting a garage door will cost about $100 extra. You may opt to have your landscaping lit, either by itself or with the whole package. Holiday lights need to be able to run on their own circuit to avoid overloading your home with their increased electricity demand. Ideally, you should have at least two or more dedicated outdoor, GFCI outlets available to run your lights on that are on their own circuits. If necessary, you may need to hire an electrician at around $65 to $85 per hour to update your outlets. If you need a circuit upgrade, this will cost about $1,300 to $3,000, while installing a new outlet will cost about $200 to $750. Professional installation helps ensure that you don’t overload the circuits on your home, potentially causing an electrical fire. Professional installation also means that you won’t need to worry about climbing ladders or accessing your roof; the installer has the capacity, tools, and knowledge to safely get your lights hung anywhere you want them. Professionals can also assist you with additional tasks, such as setting your lights to music for more impressive displays. Many installers can also help you plan the display, including adding other holiday decorations such as wreaths and ornaments, or helping you to determine where on your property to install the lights. The biggest portion of the holiday light installation cost is the labor. While your costs are higher the first year due to the purchase of the lights, this is only about $100 to $200 of your total costs; the remainder is mostly Installation, removal, and storage of the lights. This is because the labor can be very involved, including accessing your roof and the tops of trees. To do this safely, the crew may require special equipment including cherry pickers, ladders, or harnesses, as well as insurance, which will raise total labor costs. You can expect labor to take anywhere from a few hours to a few days depending on the size of your property and how many lights you are having installed at a time. In most cases, removal and storage of the lights and decorations are factored into your total package cost. This makes it more cost effective for you to use the same company each year; they know your home and light layout and have the lights on site and ready to use. Removal generally goes faster than the installation, with most lights coming down safely in a few hours’ time. By far, the biggest holiday light installations usually revolve around Christmas. In fact, most professional light installation companies will often refer to themselves as “Christmas light installers”. Christmas lights may be as simple as all white lights, or they can become incredibly complex with moving light displays that “dance” to carols. Because so many neighborhoods often become lit at the same time, you may find some installation services that can offer a discount if you have neighbors having lights put up by the same company. On average, Christmas lights end up costing between $200 and $400. Aside from style and color, one of the most frequent choices you’ll need to make when selecting holiday lights for your home involves whether to use LED or traditional lights. Both have their positive attributes. LED lights are better for the environment, lasting up to 50,000 hours without needing to be replaced and costing less money in energy costs over their lifetime. However, they can be more expensive to purchase than regular lights. In addition, LED lights tend to come on shorter strands, so you may need more strands to cover your home, also leading to higher costs. Regular lights are easier to maintain, because the bulbs can be more readily replaced if one were to break or go out. They’re also cheaper to purchase and sometimes to install, which can keep your initial costs down, even though your energy bills will go up. Typically, LED lights will cost about $230 to $930 just for the lights alone, while regular lights will cost between $154 and $670 for the same amount of lights. The latest development in holiday light technology involves laser light projections that can cover your home in stationary lights or animated figures of ghosts, snowflakes, or gingerbread men. Projectors cost about $25 to $50 a piece, depending on the size of the display. For lights that are set to music, or that you want to have more control over when you aren’t home, you can invest in app-enabled lights, or lights that are controlled from an app on your computer or smartphone, allowing you to customize the display. This will add about $100 to $200 to your installation package, as the technician will set the app for you. If you are adding greenery, such as wreaths, garlands, and trees, to your property you can opt for the pre-lit variety, which makes labor and installation easier. Pre-lit tree costs begin at about $50 for walkway trees and go up for larger displays. If you want a more whimsical display, you can also opt for set pieces to create a theme. These are generally priced by the custom display, but you can expect costs to start at $200 per piece. Many companies will store your lights for you in the off season, provided you contract with them to use them again in the following year. Otherwise, you are responsible for finding your own storage. If you don’t have the space at your home, you can rent a storage locker for $40 to $50 a month. Artificial greenery is also an option if you want the look of wreaths and garlands and would like to use the same pieces each year. Costs are usually set by the foot, but begin around $25 per piece. While most companies will install, remove, and store your lights, sometimes the maintenance is left up to you. This involves changing out damaged bulbs and the upkeep of extension cords. However, some companies will charge an additional fee of $100 per visit to perform basic maintenance should something go wrong after installation. Amperage and wattage testing should be done prior to installation. If the company doesn’t offer it, you may want to hire an electrician for between $65 and $85 an hour to do so. Schedule your holiday light installation early in the season to save money. Simply keep your lights off or unplugged until ready to show them off to avoid peak installation fees. If you choose, you can install your lights DIY as well. Invest in nets to cover your shrubs more easily and install hangers on your eaves 1 and trim to make hanging the lights easier each year. Make sure you have your amperage and wattage tested first to ensure you aren’t overloading any circuits. How much does it cost to hire an interior decorator? Interior decorators typically charge either by the hour or by the project, depending on size. You can expect to pay at least $50 to $200 per hour for services. How much does it cost to keep a light on all night? A single light will cost about $0.10 per kilowatt hour left on, but this cost can change depending on the size and wattage of the light and the type of light used. How much do light shows cost? The cost of running a light show depends on the number of strands of lights, the type of lights, and what other features you may include. You can expect costs to average $19 an hour for regular lights and $16.50 an hour for LED for a 2,000 sq.ft. home display. How much does it cost to run a string of Christmas lights? The cost of a single strand of LED Christmas lights costs about $2.07 to run for two months, while a strand of regular lights will cost about $6.90 for the same period. What type of circuit is used in holiday lights? Holiday lights may use simple or parallel circuits on 120 volts. The amount of amps or wattage you need should be determined by an electrician. What is a c6 light? A C6 is an all-purpose, mini, LED light bulb that comes in a range of colors and textures. It can be used indoors or out. How big is a c6 light bulb? A C6 bulb is considered a mini light, measuring about an inch in height, with a rounded shape similar to the traditional C9. What is a rice light? Rice lights are very tiny LED lights of less than centimeter in size on a copper strand. They come in white or multi-colored strands and often work by remote control. Electricians charge about $130 on average to install a light fixture. How much does it cost to put Christmas lights up? The cost of putting up Christmas lights varies based on how many lights, the type of lights, and how big your home is. Most people spend on average about $800 to $1,500 for holiday light installation. How much does it cost to install holiday lighting in my city? Cost to install holiday lighting varies greatly by region (and even by zip code). To get free estimates from local contractors, please indicate yours.